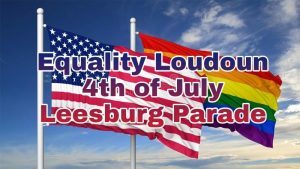 Come Walk with Equality Loudoun in the Leesburg Independence Day Parade! We plan to be lined up at 8:15AM. Anyone who can come early – 830AM, we could use your help putting together our small float, decorating the vehicle and generally getting ready for the parade. Otherwise, please try to get to Ida Lee by 930AM to walk with us. Please note that vehicles/floats/groups line up as they arrive – so, we won’t know where we are until we get there. Look for rainbows once you get to the staging area. Please come out and join us! Show your support for your LGBTQ neighbors! Wear your favorite patriotic or LGBTQ gear or both!